Born and raised on the Canadian Prairies Murray started playing guitar late in his high school years. He taught himself to play while strumming along to recordings of the Kingston Trio, Peter Paul & Mary, and Gordon Lightfoot. 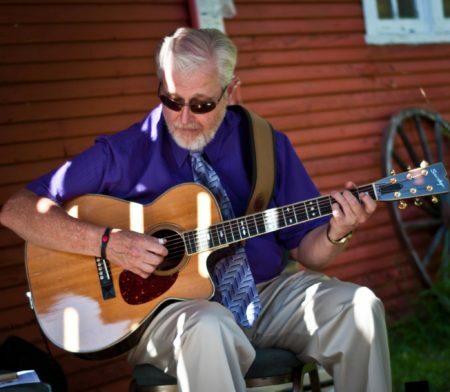 His love of folk music grew listening to live music in the church basements and coffee houses on the university campus. His self taught “camp fire strum” left something to be desired and, as an adult, sought to improve his technique by enrolling in a series of Continuing Education classes. It was here Murray discovered finger picking and the rhythmic groove of the Delta blues played by Rev. Gary Davis and Mississippi John Hurt and was hooked. Over the years his technique was honed with instruction from Don Gowan, JP Haung, Norm Yanofsky, Steve Fisher, Bob Evans, Jim McLennan and many hours of just playing and listening. Murray started playing bass when the regular bass player, with Soul Purpose, would lay down the bass and pick up a guitar to sing a song. He enjoyed the bass and continued playing both bass and guitar with The Lost Followers, Blue Rambler and Tessitura, after Soul Purpose disbanded. The bass is now his main instrument, except for solo gigs and songwriting. Many people contributed to his musical journey, but none more than the wonderful people at the Foothills Acoustic Music Institute (FAMI) Camps. An atmosphere of encouragement and support for all levels of players. It was at Camp that Murray started writing songs again, performing in public, and where he met many musical friends. Murray has been writing songs for many years and attends Songwriting Circles and Workshops whenever he can. He has attended workshops given by some of North American leading songsmiths: Mary Gauthier, Dan Bern, Hayes Carll, Sam Baker, David Francey, Stephen Fearing, Wyatt Easterling, John Wort Hannam, Emily Triggs, Jolie Holland & Samantha Parton to name a few. Two of his songs are included on MS Behavin’s By Request CD and one of his songs was on the Lost Follower’s Shootin’ the Moon CD. Murray is currently working on a CD of featuring 13 of his original songs interpreted and performed by himself and his friends . The CD will be released in the Spring of 2019. There have been many musical influences in his life from the folk sounds of Gordon Lightfoot and Ian & Sylvia; to the story telling ballads of singer/songwriters Kate Wolf, Eric Bogle, John Prine and David Francey; to the guitars styles of Merle Travis, Mississippi John Hurt, Rev. Gary Davis, Doc Watson to name but a few. Murray plays has a collection of hand made instruments: a guitar and mandolin by Regina luthier Peter Sawchyn, a guitar by Didsbury Luthier Jake Peters and an electric bass by Wimberley Texas luthier Scott Beckwith.